Let’s face it – sometimes homeschooling is hard. We get in a rut or have a week where it feels like everything is a battle. Sometimes there’s even a day in there filled with meltdowns, possibly even a teacher meltdown. Whenever we have a day or week like that, then I try to do a little reset. I think of it like rebooting the homeschool. We get to wipe the slate clean and start over, but only if we disrupt things a little first. 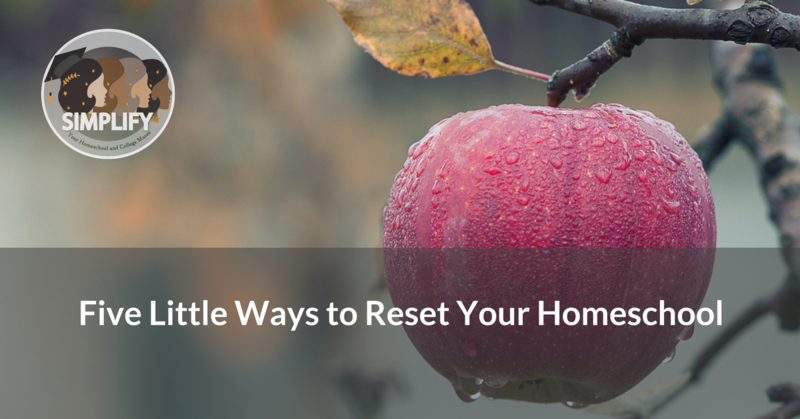 There are a million ways to get that tweak to reset things, but here are a few suggestions. I think the easiest and most obvious way to reset your homeschool is stop what you’re doing and take an impromptu field trip the next day. It gets you out of the house and away from whatever wasn’t working. It engages you and your kids in learning together. Plus, nothing says “this is not regular school” like dropping everything for a sudden change of plans. Go somewhere you haven’t been in awhile or somewhere new. Have a treat while you’re there or take something fun in your packed lunch. Let the kids turn the dial in the car on the way or put on everyone’s favorite audio book. Let it be an educational day, but a really relaxed one away from the house. Sometimes, it’s not what you’re doing, but when you’re doing it. Maybe math needs to be first to get it out of the way. Or maybe it’s too hard to get everyone focused just before lunch and you need to eat earlier. Maybe you need to start with everyone’s favorite subject to get everyone excited for the day. Write down your schedule and hit reshuffle and see where it leads you. This is one of those simple tweaks that can make a huge difference for some families. Spend the day doing school at a coffeeshop. Sometimes, the thing you need most is just a new venue for a little while. It’s crazy how much doing your math and reading with a Panera cookie in a booth can suddenly make it all work so much better. If you don’t have a good coffeeshop or cafe, then the library is a good alternative. If the weather is nice, you can set up at a picnic table at your favorite park. We once did school in a museum courtyard all day, which was a wonderful experience and a much needed escape after a very grouchy week. Sometimes you just need to put all the difficult work aside and sit on the sofa reading aloud to younger kids, watching documentaries with your middle schooler, and playing games with all your kids. It’s still real work to pull out that book of puzzles you keep meaning to get to or engage in an epic day of card games and movies. I find that when we do this, it helps reset me even more than the kids. I get time to talk to the kids in a new way and they open up and relax. While we no longer cuddle on the sofa with an illustrated book, I still do versions of this with my teens sometimes. It’s for everyone who needs a reset. Take one thing out and add one thing in. If you’re mostly happy with what you’re doing, then you don’t want to redo your entire schedule or routine. However, sometimes it’s a good idea to look at your day and realize that there’s one little thing that’s a problem and just boot it from your lives. If that “one little thing” is math, then obviously that’s not an option. However, often it’s something that can go, like that Latin program you really wanted to love but sends your kid into a fit or that vocabulary drill you think your student needs but which he hems and haws over every single day. Whatever it is, let it go. And in its place, put in a simple routine that is more enjoyable for everyone. Maybe your elementary schooler needs a read together time to start the day, maybe you all need to have a poetry tea together once a month or always start math with a quick card game. Maybe your high school student needs time to go back to the online game she used to love for a few minutes each day. Pick something small and simple, but that you know will help you all either refocus or enjoy yourselves more. Add that in instead of the sticking point to your day. These are really all little changes for when you’re happy with your homeschool overall, but things have stopped working. These all just grease the wheels. If your homeschool is having more than a rough couple of weeks, then my next post, Five Radical Ways to Reset Your Homeschool, is for you.